Pen and ink and wash drawing by Frederick Charles Maisey of relics found opposite the south gateway of the large stupa of Sanchi, from an album of 60 drawings, dated 1847-1854. 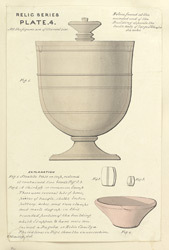 This drawing depicts a steatite vase and a lamp and other small relics found in a building near the great stupa. The Buddhist site of Sanchi is of outstanding importance for the number and variety of its monuments and sculptures. Its Buddhist structures, mostly stupas, were built between the third century BC and the sixth to seventh centuries AD. Situated in a peaceful and meditative site crowning a hilltop, Sanchi was ideally located in proximity to the prosperous city of Vidisha. The foundation of this monastic centre were laid by the emperor Ashoka (reigned circa 269-232 BC) who built the original stupa (Stupa 1) and erected a monolithic pillar in the third century BC. The stupa was later enlarged and encased in stone around the 1st century BC under the Shungas and four magnificently carved gateways or 'toranas' were added at the cardinal points. The other structures located on the hilltop consist of basements of smaller stupas, apsidal-ended shrines, structural temples and monasteries. With the decline of Buddhism the site decayed until it was rediscovered in the19th century and the restoration activities started at the beginning of the 20th century.